March 13 is K9 Veterans Day, the day when all military dogs should be commemorated. This is an unofficial holiday, but the enthusiast make efforts to change the situation. The United States K9 Corps were created on March 13, 1942. Since then the dogs officially became the part of military service. Border Patrol K9s, Customs K9s, Police K9s, Secret Service K9s, Airport Service K9s and FBI K9s daily work to save and protect the Americans and the homeland. That is why military dogs should be honored accordingly. Military dogs have always been a part of American military efforts. They continue to serve on the borders on land and sea everyday. 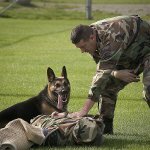 The dogs are trained to provide numerous functions, including search, rescue, explosives detection, scout, patrol and enemy subdue. K9 Veterans Day was created by Joe White of Jacksonville, Florida. He was Vietnam War veteran, K9 handler and trainer. Joe White died on October 24, 2009 and since then his wife continued the effort to get nationwide recognition for this holiday. New Jersey officially recognized the holiday in 2010. The enthusiast from other states sign petitions to show the public support for her efforts to legislators.